American sculptor Beverly Semmes occupies a fault-line between fashion and art. Inspired by her work as a set designer for the ballet, Semmes’ monumental fabric creations fuse personal fantasy and social commentary. Incorporating highly sensuous materials, velvet, tulle, organza and lamé, her sculptures explore the power of clothing and its ability to influence, and even define the self. Semmes has been exhibiting internationally since the 1990s. She has had solo exhibitions at the Sculpture Centre, New York; Camden Arts Centre, London; the Museum of Contemporary Art, Chicago. 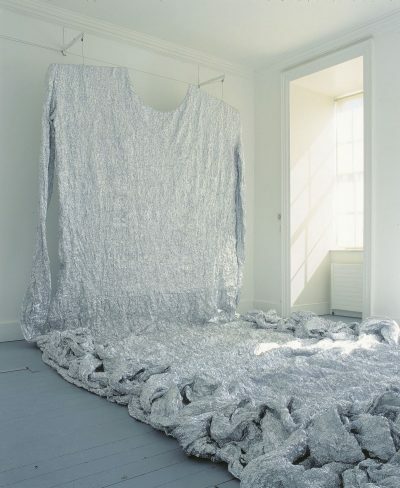 ‘Beverly Semmes: New and Recent Sculpture’ was shown at IMMA in 1996.